CUCUTA, Colombia (AP) — Defying orders banning him from leaving Venezuela, opposition leader Juan Guaido made a surprise appearance at the end of star-studded aid concert in neighboring Colombia, joining thousands of other Venezuelans in pressuring President Nicolas Maduro into allowing the delivery of emergency food and medicine. In Venezuela, a much smaller crowd gathered for a rival, three-day “Hands Off Venezuela” festival being organized by Maduro. Even as several million Venezuelans flee the country and those who remain struggle to find basic goods like food and antibiotics, the embattled president claims the relief effort led by Guaido is a U.S. orchestrated ploy to oust him from power. But once he arrived at the giant stage located next to the Tienditas bridge connecting the two countries he was greeted like a rock star himself. Thousands of Venezuelans shouted “Juan arrived! Juan arrived!” when they spotted him donning a white shirt and accompanied by a large contingent of Colombian security as he made himself through the front of the crowd. The presidents of Colombia, Chile and Paraguay were on hand to be the first foreign heads of state to embrace the 35-year-old lawmaker since he declared himself interim president a month ago at an outdoor rally. The optimistic mood at the Live Aid-style concert opened in the Colombian border city of Cucuta couldn’t mask underlying tensions a day before Maduro’s opponents embark on a risky strategy to undermine Maduro and bring in the aid being amassed along three of Venezuela’s borders. But the crowd reacted with joy when Guaido suddenly appeared. Thousands of kilometers away, near a crossing with Brazil, a member of an indigenous tribe was killed and 22 more injured in clashes with security forces who enforced Maduro’s orders to keep out the aid. British billionaire Richard Branson organized the “Live Aid Venezuela” concert, which featured dozens of Latin musicians performing on a bridge-side stage not far from where Maduro’s government has placed a giant shipping container and tanker to prevent the delivery of U.S.-supplied food and medical kits. As Venezuela’s political turmoil drags on, allies of Guaido, who the U.S. and dozens of other countries have recognized as Venezuela’s rightful leader, are hoping the massive concert in Cucuta will set the stage for the smooth delivery Saturday of the aid and a turning point in their quest for a transitional government. The promised “humanitarian avalanche” is taking place exactly a month after Guaido declared himself interim president in an outdoor rally. After the concert, Venezuela’s Vice President Delcy Rodriguez said her government was ordering the partial closure of the border with Colombia hours ahead of the planned delivery of the humanitarian aid. 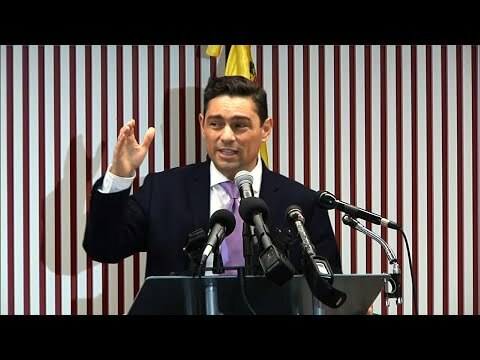 Rodriguez said on Twitter that the government was temporarily closing three crossings in Tachira state because of the “serious and illegal threats” against Venezuela’s peace and sovereignty coming from Colombia’s government. At the concert venue, the feeling was one of collective catharsis, especially for migrants who in recent years have fled Venezuela’s economic implosion by crossing into Colombia. Under a scorching sun, those in attendance waved Venezuelan flags, squirted water at each other and swayed to music by marquee artists including Colombia’s Carlos Vives and Mexican rock band Mana as well as a host of Venezuelan performers. Reymar Perdomo, a Venezuelan street singer who rose to fame for a video went viral showing her singing on buses in Peru, kicked off the concert with her signature song, “Me Fui,” Spanish for “I left,” which has become the unofficial anthem of the mass exodus. The plan to bring in aid is the most ambitious — and potentially dangerous — that the opposition has attempted to undertake since Guaido decided to challenge Maduro’s rule. Days after Branson launched his concert, Maduro’s government announced that not only would they hold a rival festival but that they would also deliver over 20,000 boxes of food for poor Colombians on Friday and Saturday. In contrast to the festive spirit in Cucuta, most of the acts at the pro-government show were lesser known, the crowd of a few hundred much older and some attendees reported being bussed in by the government from as far away as the capital, Caracas. After the concert concluded, Guaido spoke alongside Duque and Pinera at the warehouse where the aid is being stockpiled. He said he was able to circumvent Maduro’s travel ban only with the help of the Venezuelan armed forces, whose loyalty to Maduro has so far been impossible to break and will once again be tested Saturday. This story corrects location from Urena to the Colombian town of Puerto Santander.